﻿ What's In It For You? It has never been easier to get into playing chess. The internet has revolutionised how people play and ANY player can quickly get to play a player of similar standard online. However, the best way to learn is by learning from more experienced players, meeting them, playing them and talking to them. The club is a friendly easy-going environment and we’re always happy to help people who’d like to know more. And hopefully we’re fun too. Many people play infrequently with friends/family or play online. Playing online is fantastic, but isn’t necessarily a great social experience (especially if your anonymous opponent turns into blue-mouthed troll as soon as they start losing). The club is a great place to learn more, will be fun and can act as a bridge to playing rated competitive games. We play off season. We’re free. We’re friendly. There is no commitment or hassle. MSCC can be light-hearted alternative to playing rated games, and an opportunity to learn and improve. There is free informal coaching and a great chance to get in some over-the-board practice before those crunch matches! The club is a great chance to help bring back chess back to the heart of Greater Manchester and have a genuine Manchester Chess Club. 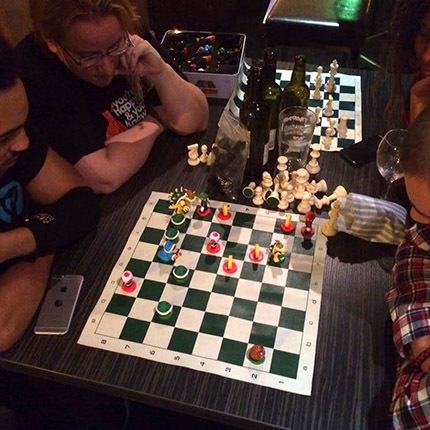 As a weekly gathering of chess players, it will be what we as Manchester’s chess enthusiasts make of it. Please come along and see what you think!